First, I'll share with you 5 best hunting safety harness reviews. Latter, you'll know how important a full body harness for treestand hunting can save your life. Last but now least, how to rescue yourself in case of falling is the last section. Sounds good? Let's dive into it. 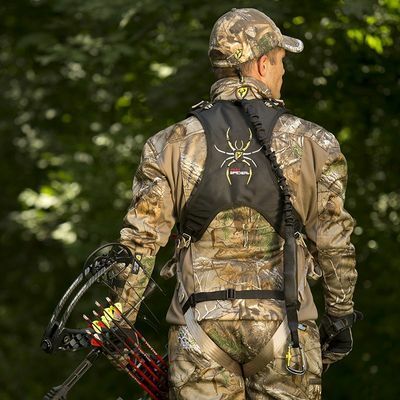 Why Do You Need A Hunting Safety Harness? The Tree Spider Safety Harness has a weight rating of 115-300 lbs, making it one of the most durable and sturdy, as well as the best treestand safety harness out there. Its 16 x 1.5 x 4 inches product dimension is skillfully designed to suit any body size perfectly and can be carried without restriction. Of course, the wide product dimension lets you stand confidently on the treestand without discomfort. That said, the included Ario Mesh back with an X Web Fit that lets the harness move with you comfortably gives this product the nod. This way, your comfort is assured, and you'll not need to carry the harness by hand. Did I also mention that it features a chest adjustment strap coupled with a YKK buckle? Yeah, it does, and this makes up for easy adjustments while on the tree ﻿﻿stand﻿﻿. That's not all; the Tree Spider also comes with a shoulder strap as well leg adjustments for easy adjustments when the harness gets too stiff on you. In the event of a fall, the included bungee tether shock absorber and climbing loops let you get back to the tree stand without much hassle. I so much love the balanced agility of this harness as it provides you with all the security features such as shoulder strap, suspension relief strap and leg adjustments--all to keep you well positioned against a fall. The Tree Spider seemed to dwarf its competitor by housing extra features such as one tree strap, one lightweight, a Suspension Relief System, one safety DVD, and aluminum Powerlink Carabineer. You can be sure not to fall off tree stand when you have the Tree Spider Speed Harness on you. The lightweight capacity of 115-300 lbs is sure to carry anyone, but the issue with the harness is that it gets expired with time. The UltraLite Flex Harness is one the best hunting safety harnesses with a mesh cell phone pocket to keep your smartphone in place while you're busy hunting or call for rescue in the case of an emergency. The padded hexagon feature allows the harness to fit your body and allows smooth flexibility. The HSS Safety Harness is one of the lightweight harnesses on the market, and it features extra accessories for your improved security. The weight of 2 lbs makes the harness very light for easy transport. While the UltraLite does not feature multiple adjustment straps like the Tree Spider, it does shine brilliantly by the Suspension Relief System and Lineman's Climb Strap to keep you safe on the tree stand. 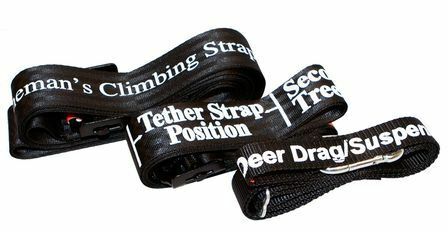 You will also find the 1.25" tether, a waist buckle and upper body webbing useful as they provide extra strength and reduce the weight of the harness on you. 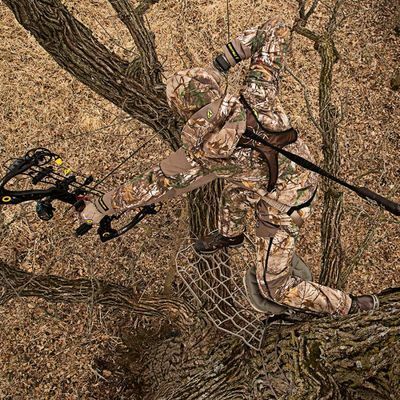 The Hunter Safety System Harness also prevents you from dangerously dangling on the tree stand. 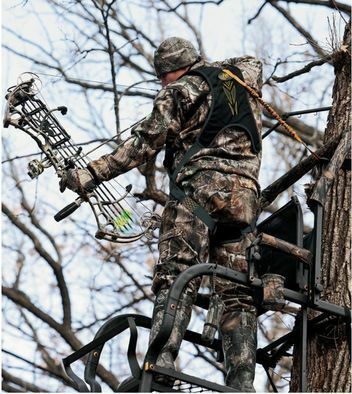 The Patented design of the harness helps you stand comfortably on the tree stand. The unique perk about the Diamondback Harness is the included pre-loaded gear hooks for hunting gears such as a binocular, monocular, grunt ﻿call or r﻿angefinder﻿﻿﻿﻿﻿. Designed for comfort and longevity, the Diamondback Harness is equipped with a non-tangle design and a Lineman's climbing rope for easy use. The Muddy Hunting Safety Harness is the definition of lightweight. Weighing only 2 lbs, it lets you move the harness quickly without any hassle. It features lightweight padded nylon and quick release buckles for comfort. With a weight rating of 300lbs; the Diamondback Harness is the best arrest system that you will find useful in your hunting. It also features a two-way adjustable chest buckle and two quick release buckles for your stability and comfort. It's equipped with airflow Mesh that lets you breathe well and act as an padding against the tree also, a Carabineer clip and Silencer Sleeves. For extra comfort, the Diamondback Harness features accessory loops, thick padded shoulders and an anti-shock bungee tether that lets your body fit into the harness. The Mesh design keeps your body cool during long hunts, while the included flexible tether enables you to rotate up to 360 degrees without restriction. The Muddy Tree Stand Safety Harness has other unusual features such as 2 gear loops and an easily accessible pair of binocular straps. You can easily put on this harness, thanks to the quick release buckle and adjustable straps. You can now take shots freely with the Shock bungee tether. The nylon vest-style ensures a safe put-on and reduces tangles. It includes extra features such as Tree strap, Lineman's belt, and Suspension Relief Strap. One size of the Diamondback Harness fits the most. Fitted with a military-inspired MOLLE (Modular Lightweight Load-carrying Equipment), the Summit Treestand Men’s Pro allows you to quickly attach many accessories that will aid your hunt without any hassle. The included lineman’s climbing rope provides for a smooth climb when installing your tree stand or any other higher hunting equipment. It also allows you to have continuous contact with your tree to avoid a fall. While it has a decent 300lb weight rating, the Summit Pro Harness is designed to fit the shapes and size of any hunter. The strong rope, with padded shoulder straps, lineman’s climbing rope, and a military-inspired attachment system can hold a weight of about 300 lb while on the tree stand. The Summit Pro Safety Harness is also tangle-free and easy to put on. Readily available in three sizes of Small, Medium and Large, you are sure to get the size that will fit you and allows for flexible movements when aiming in at the game. Also, for proper fitting, this Summit safety harness comes with a comfort-torso strap that cinches the harness to your body. The included slides allow you to adjust your straps quickly so you can be sure of smooth movements and flexibility. It is interesting to note that this Summit Safety Harness can be worn over or beneath your hunting clothes. The Prusik knot and ultra-quiet design features let you get enough coverage to elude detection when hunting. It won't be a bad idea to take your child hunting when you have the Lil'Treestalker. The Lil'Treestalker is the best youth safety harness to keep your child safe while you hunt. One of its impressive features is the included two pockets to keep essential gears such as suspension relief strap or a two-way radio. The HSS-8 is the youth hunting harness you can get out there with the assurance of durability and comfort. It is designed for the youth and children with the weight capacity of 50-120lbs. Its dimension of 1.3 x 13 x 3 keeps youngsters comfortable. With the Lil'Treestalker safety harness in place, you can now take your child along with you to your 2 man ladder stand. You can now leave your child in the Lil'Treestalker and enjoy your hunt with your buddy all day long. The Youth HSS-8 also features an adjustable chest and waist straps that will fit your size. The Lil'Treestalker is designed with the same specifications as the adult Hunter Safety System (HSS) Safety Harness. It has adjustments that will ensure a proper fit of 50-120 pounds on your protégé. The adjustable chest and waist straps with its quick-snap seat belt style buckles make it easy to put on and adjusted quickly for a good fit. The Lil'Treestalker hosts extra features that will ensure the safety of your younger hunter. It includes built-in webbing, a Hunter Safety System life-saving Suspension Relief System and a Deer Drag that lets you efficiently haul ﻿your deer home. You see, falling from tree stands while hunting is fatal and can result in serious injury, such as spinal﻿﻿ harm. One of the best ways to combat the risk of falling is the use of a safety harness as it gives you more protection than other fall safety measures such as safety belts and rails. 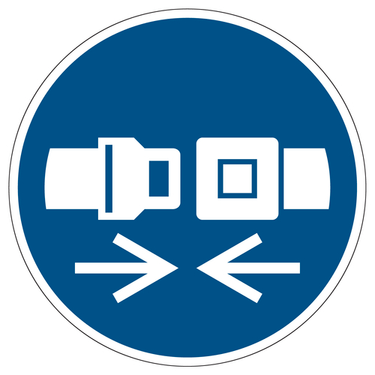 The use of full body safety harnesses distributes the force of a fall. With the help of a safety harness, which offers shoulder straps, the effect of a fall can significantly be limited to protect you from many injuries. This happens to be the best part of its function. The use of a safety harness acts as a guardian Angel to keep you upright should in case you mistakenly slip off your leg on the treestand. Safety harnesses should be always replaced at intervals of 3-6 years, along with ropes, shoulder straps, safety gear, safety straps and lineman’s straps. The truth is, there is no perfect system or harness out there. Some of the safety harnesses out there have some follies, and this makes you vulnerable to a fall. 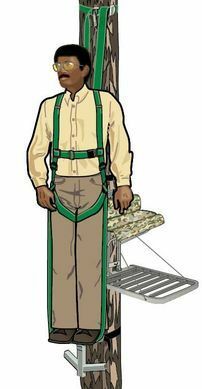 The treestand fall arrest system only gives you the appropriate protection for your task, and if you get to fall from it, you are likely to get hurt in some way. You should always have this in mind that there might be an unexpected fall and this should help you make alternative precautions against a fall. I was opportune to have some fall restraint background from my workplace where we were trained on fall restraint/protection. 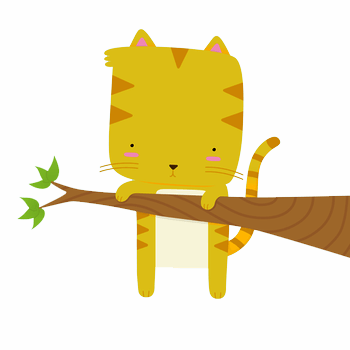 One of the first measures against a fall is always to prevent a fall. So, to prevent yourself hanging below the stand for a long time, it's advisable to use fall restraint systems as they place tremendous amounts of pressure around the hamstring and quad. If you don’t relieve the pressure quickly, you are likely to experience a fall within 10 minutes. Also, you want to have a tension release method/system if you’re caught in that situation. If you find yourself hanging below a tree stand for about 15-30 minutes without any tension on your hamstring, this may likely lead to suspension trauma. You might think to yourself: what is suspension trauma? The aim of a hunting safety harness is to save the hunter from the trauma of a fall. However, the person can still be in grave danger of a life-threatening situation called Suspension trauma if he/she is suspended in the air. Suspension trauma occurs when a person falls from a given height and is held upright in the air with little or no movement for a given period of time, usually around 30 minutes. Of course, this can lead to the blood flow all trapped to the legs, as result, less amount of oxygen being supplied to the brain. If this occurs over a period of time, the victim might lose consciousness, which can lead to death if not quickly recognized and treated. 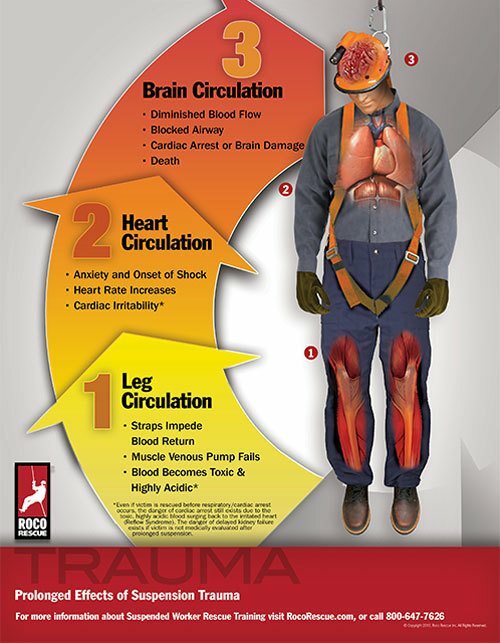 How to Prevent Suspension Trauma? Well, just like every accident, prevention is always the answer. You can prevent this by calling for help if you find yourself in such situation. But the best step to take regarding this is to get a suspension trauma straps. You can as well tie a long prusik onto your rope and step into it. The use of these precautions will take off the weight off your legs and allow blood to flow to the rest part of your body and supply oxygen to your brain in the case of a suspended fall. It is normal to hunt daily when the d﻿eer ﻿season arrives. You are likely to miss some things when climbing﻿﻿﻿﻿﻿﻿﻿﻿﻿﻿﻿ ﻿your ﻿tree stand and this neglect might lead to your fall. Always inspect your tree stand for tears, bad rust or missing nuts before you climb. 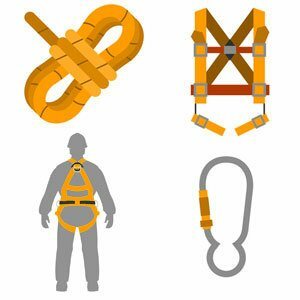 Your safety harness should also be inspected; check for worn-out straps and ropes. Much pressure on them might make you fall off the tree. 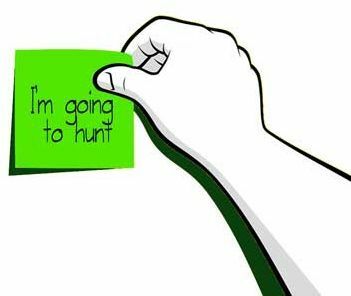 Another safety tip you should remember is to inform some other person anytime you go out hunting. You can leave a note or verbally notify the person. Let him know where your tree stand/ your hunting location is and the duration of your hunt. You can never tell; the person might come looking for you when you exceed the time you stated. You cannot rely on your cell phone for communication because there might be no service or you might lose it when you fall. 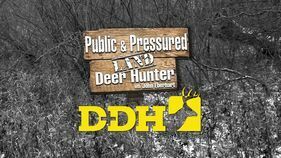 Keeping someone in a notice of your hunt is a good safety measure you should use. Don’t be in a hurry to climb your tree stand when the deer season arrives. 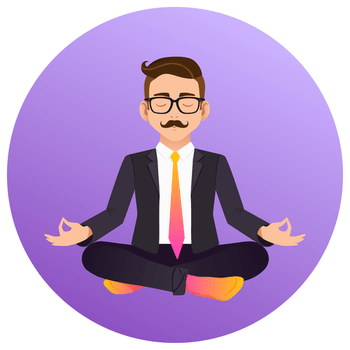 Being in a hurry will cause you to be anxious and have a non-relaxed mind. While climbing a tree stand is dangerous, you should try not to be worried. Also, remember to double-check if you are well-clipped and you are climbing the tree stand correctly. Tree stand safety is for the worst scenario – falling. You have to know how to rescue yourself when you get to fall. In last chapter, I'll show you how to self-rescue in case of falling in more detail. So keep reading. Avoid climbing the tree stand with your gear such as a ﻿﻿bo﻿w or backpack. This adds extra weight to you and likely takes out your full concentration when climbing. Always try to have two-haul lines or pull ropes that will help you in climbing. Always keep your tree belt above your head. In case of falling, it can keep the distance short and eliminate injury. If you are choosing the best hunting safety harness, there are a few things to keep in mind to get the top one. You have to carry the safety harness along with you or put it on when climbing your tree. Your choice of safety harness should be one that is very light and doesn’t have much weight. 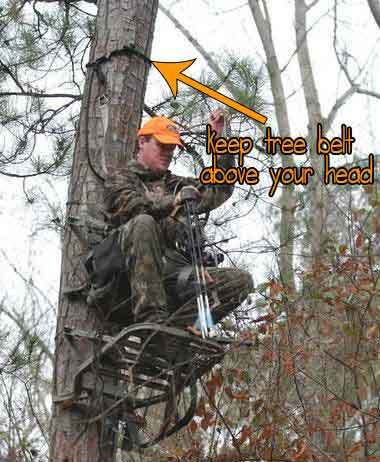 The lightweight feature of a safety harness makes it easy for you to have less trouble when climbing your treestand. You wouldn’t want a safety harness that will drain your energy when taking it off. Choose one that gives you the flexibility to easily put on and taken off without much hassle. Your comfort is next to your safety when on the tree. You should avoid a safety harness that will keep you uncomfortable as this might result in a fall. Choose a safety harness with a space dimension and higher weight rating. Go for a safety harness that doesn’t tangle and lets you have excellent flexibility. You need enough slack in your lifeline to allow you to stand, sit, turn around and draw your bow. The Slack feature keeps you well-strapped to your lifeline. Step 2: Use your upper body strength to get onto your climbing sticks / climber / ladders and get back to the tree. Step 3: Call emergency rescue if you can't touch above gears. As you know, getting the best treestand harness for bow hunting isn’t an easy job. To solve this problem, we’ve scoured the world to give you the top hunting safety harness that is currently making waves on the market. 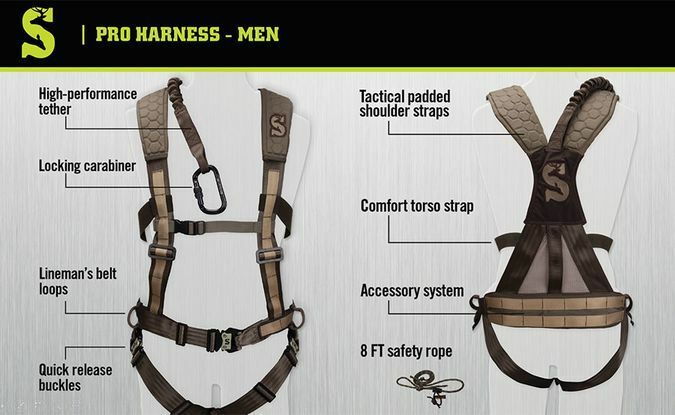 Our go-to safety harness will always be the Hunter Safety System UltraLite Flex Harness. This is due to the impeccable features that set it apart from other bow hunting harness. It features a padded hexagon that fits comfortably on your body and allows for flexibility. Its patented design lets you sit comfortably on the tree stand, and you can be sure to stay in that position without falling. The most impressive feature is the 2lb. The low weight allows you to transport it easily to and from your hunting. Your safety is assured with the adjustable tree strap and a suspension relief system that holds you upright if you get in the position of falling. 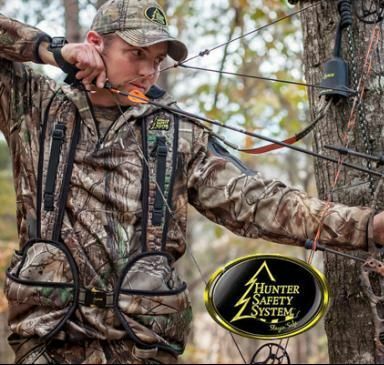 These impressive features and its affordable price make the Hunter Safety System UltraLite Flex Harness the best tree stand harness out there. We hope that this post helps you pick the best hunting safety harness. If you do have any questions or suggestions about our list, let us know in the comments.